Posted By : Katie L.
It’s undeniable that we love our fur babies as if they’re our own children. So why do many pet parents not have their pets covered if an unplanned illness or accident happens? In this blog post, we will go over what pet insurance is and what Healthy Paws, Embrace and Pets Best – three of the largest pet insurance providers in the US – can offer your furry loved ones. Note: This is our unbiased comparison of the offerings of these three pet insurance providers. Just so you know, PawBoost may collect a share of sales from the links on this page. According to Frances Wilkerson, DVM, pet insurance is comparable to human health insurance in the way that it assists covering the cost of veterinary care. Similar to human insurance, there are deductibles, co-pays, maximum payouts, premiums, waiting periods, and pre-existing conditions are not covered. Without pet insurance, you will be paying out of pocket for all medical (veterinary) bills – just like with human health insurance. Pet insurance differs from human health insurance as it does not use networks. You can visit any licensed veterinarian in the U.S. and some plans will permit you to see licensed veterinarians overseas if you’re traveling. Without pet insurance, you will pay out of pocket for all veterinary bills. Example from Embrace: After being hit by a car, your dog is faced with some serious injuries. 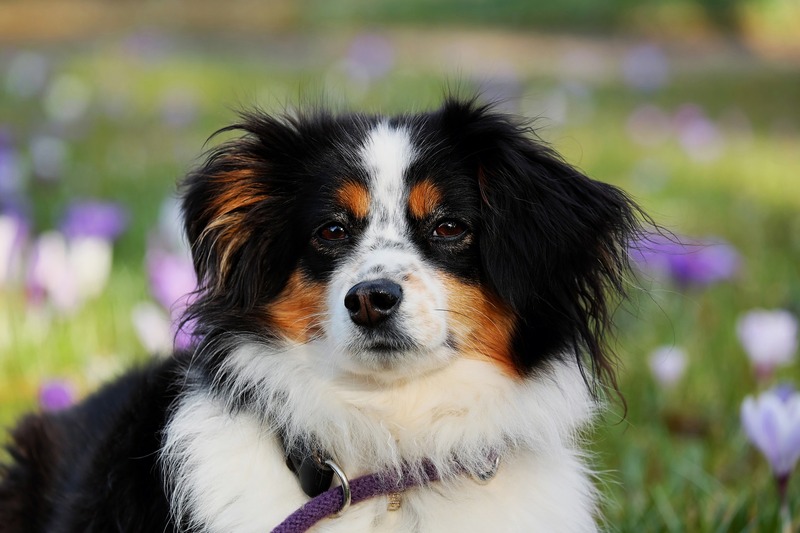 Your dog will need surgery and extensive rehab. Example from Healthy Paws: Your dog has had diarrhea for several days and isn’t getting any better so you take them in for a check-up. The check-up includes lab work and getting prescriptions. When should I get pet insurance? Dr. Doug Kenney says, “the best time to buy pet insurance is when your pet is young – preferably a puppy or kitten and before they get sick.” Many pet parents don’t feel the need to buy their pet insurance because they are young and healthy. Unfortunately, accidents do happen and illnesses can appear irregularly that can be expensive. One of the most significant reasons to buy pet insurance while your fur baby is young is to prevent having claims refused because of pre-existing circumstances. See our comparison of what these pet insurance companies cover and do not cover below. 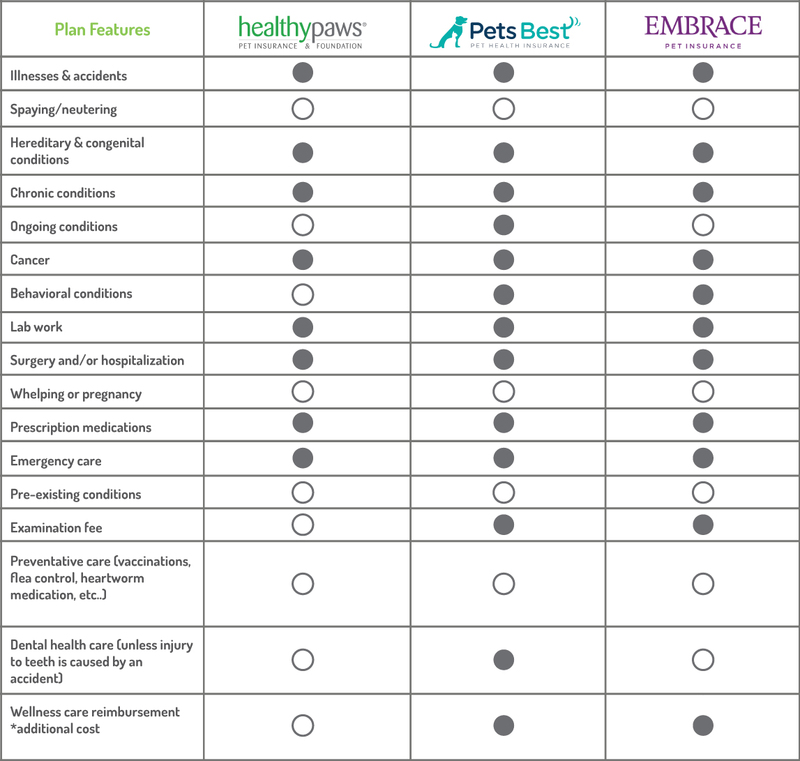 The above chart highlights features we think any pet owner would look for in a coverage plan for their fur baby. Pets Best covers the most of these categories (13) of the three, followed by Embrace (11), and finally Healthy Paws (8). Pets Best and Embrace also offer another benefit for an additional cost, a preventative care plan. These plans include routine care such as wellness exams, vaccinations, teeth cleaning and much more. 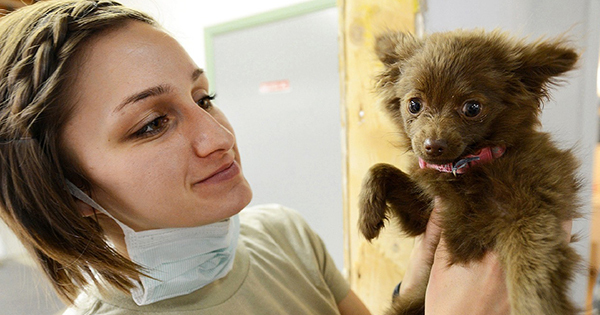 Which pet insurance you should get depends on what is right for you and your furry loved ones. It’s never too early (or too late) to get pet insurance for your fur baby! With Healthy Paws Pet Insurance, you can give your pet the best medical care possible. Protect your pet’s health with the #1 customer-rated pet insurance plan! Learn more by getting a free quote and let Healthy Paws pay your vet bills while you care for your pet. 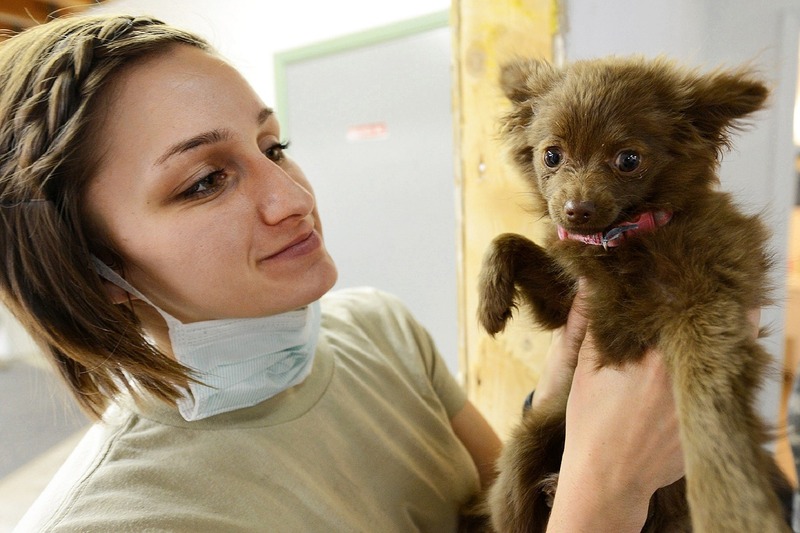 Curious about pet health insurance? Check out Embrace Pet Insurance for a FREE quote and more information. Cover up to 90% of your pet’s unexpected veterinary costs with a top rated pet insurance plan including flexible coverage options, and no annual or lifetime limits. Free Pet Insurance Quote From PetsBest.com! YES YES YES!!!!!!! Pet Insurance is a MUST. I will NEVER be without it. Medical conditions are VERY EXPENSIVE….even something like diabetes which seems to be more common…..or teeth being pulled….or calcium oxalate stones and bladder surgery….or a high deadly fever…all things that I have dealt with. You don’t ever want to be in a position where you cannot afford to help your animal…your precious family member. Just do the research on the different pet insurances to see what resonates with you. BUT do NOT pass it up. THANK YOU for this IMPORTANT ARTICLE!!!! I’ve had insurance since shortly after I brought my furbaby home. I haven’t needed to use it, but being on a limited fixed income, it’s important to me to know that if something happens I can get him the vet care he needs…and not be put in a position where I’d have to put him him down because I can’t afford to pay the vet bill. I’m with Trupanion and I did a lot of research before I made my decision. Know what’s available, and exactly what is offered so you can make the best informed decision. Thank you for the informative article! 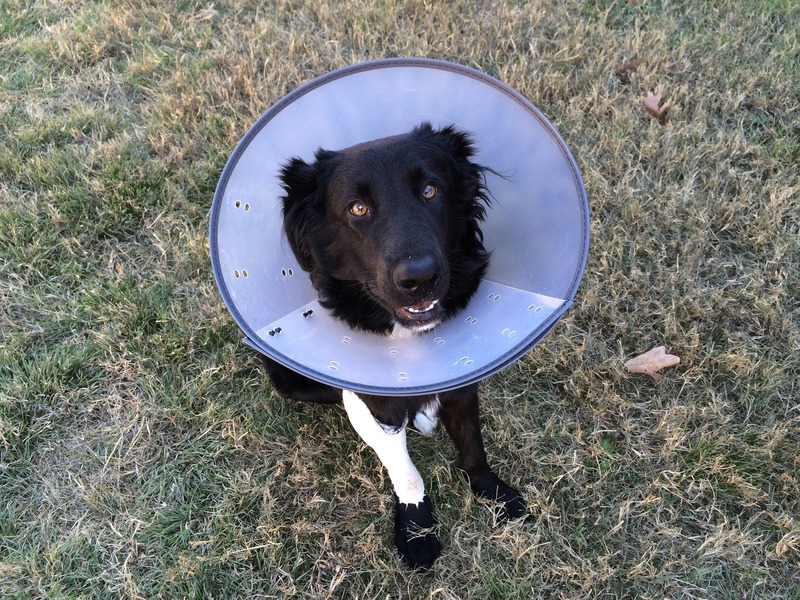 Getting pet insurance was one of the best decisions I’ve made! After doing my research and comparisons, I chose Embrace (and they do offer spay reimbursement). 2 of my 3 were puppies when we started with Embrace and I am so glad I choose the wellness while they were babies! Shots, checkups, shots, checkups, spaying, and more shots & checkups, and they picked up some type of virus from the shelter I had gotten them from! I loved having the wellness, it was so worth it during their first year! I was reimbursed for a major part of what I had spent! After their first year, I had to drop the wellness part because I couldn’t afford it, but I am keeping the insurance for emergencies! I wholeheartedly agree that if you are going to have pets and really try to take care of them, insurance is a great idea!